In the simplest terms, LNAPL transmissivity (Tn) quantifies the rate that LNAPL can be pumped from a well. LNAPL transmissivity can readily be measured and compared to a threshold standard established by regulatory authority or site stakeholders. However, as discussed in this appendix, there is a broader spectrum of uses for LNAPL transmissivity: planning for LNAPL recovery pilot tests, optimizing and tracking LNAPL recovery remedies, designing LNAPL recovery systems, and making a case for compliance with policy requirements for LNAPL recovery to the maximum extent practicable. LNAPL transmissivity describes the capacity of aquifer materials to transmit LNAPL. It is analogous to groundwater or aquifer transmissivity and is expressed in units of square length over time, which represents the flowrate of LNAPL through a unit width of aquifer under a unit gradient. Tn describes a basic relationship between LNAPL drawdown in a well and LNAPL flow to that well. This makes it a representative metric for LNAPL recoverability by any hydraulic method—including skimming, pumping, vacuum extraction, or manual bailing. Tn measurements must be used in context of the overall LCSM; identifying potentially confined or perched conditions and understanding seasonal changes are important to accurately measuring and appropriately using Tn as a metric. Tn measurements are relevant to LNAPL saturation remedial objectives (e.g., recovering NAPL to the maximum extent practicable, or controlling LNAPL migration) and are not directly relevant to composition-based remedial objectives (e.g., meeting dissolved-phase groundwater standards). A key difference as compared to the basic concept of groundwater transmissivity is that LNAPL moves in a multiphase (LNAPL, groundwater, and soil gas) flow regimes and, therefore, LNAPL transmissivity is a function of the LNAPL saturation and relative permeability of porous media to LNAPL flow. Groundwater transmissivity is also affected by the presence of LNAPL and is a function of the water and LNAPL saturation and the relative permeability of the porous media to groundwater flow. LNAPL transmissivity is not an intrinsic property of the media alone, but also depends on the multiphase conditions and the properties of the LNAPL. LNAPL recoverability is not directly proportional to the thickness of LNAPL that accumulates in a well (Kirkman, Adamski, and Hawthorne 2013). However, LNAPL recoverability is directly proportional to LNAPL transmissivity. Therefore, LNAPL transmissivity can be used as a threshold metric to evaluate LNAPL migration concerns or a performance metric for LNAPL recovery evaluation. Historical and recent research substantiates the use of LNAPL transmissivity as a reliable indicator of LNAPL recovery potential [(Kolhatkar et al. 1999); (Lundy and Zimmerman 1996); (Kirkman 2013); (ASTM 2013); (API 2016); (Palmier et al. 2000)]. This research identifies the theory that underpins LNAPL transmissivity and how data analysis practices have evolved over time [(Lundy and Zimmerman 1996); (Huntley 2000); (Kirkman 2013)] as well as model and field validation of various methodologies (Kolhatkar et al. 1999) and (Palmier et al. 2000). LNAPL CSM: During development of the LNAPL conceptual site model, existing information on transmissivity and related parameters should be reviewed, and LNAPL transmissivity can be used as one line of evidence to evaluate LNAPL migration concerns. Pilot Testing: LNAPL transmissivity measurements can be used to plan pilot tests. Depending on scale and type of test, the LNAPL transmissivity measurements on their own may be considered a pilot test of LNAPL recovery. Technology Selection and Design: The results of LNAPL transmissivity testing can be used to guide selection of remediation technology, determine equipment sizing, and establish appropriate recovery well density. Remedy Optimization and Progress Tracking: LNAPL transmissivity may be used to track and optimize remediation, identify areas to focus remediation, and estimate remediation timelines. Technology Threshold Metric: An LNAPL transmissivity between the range of 0.1 to 0.8 ft2/day may be used as a decision point for remedial system operation or technology transitions. Defining maximum extent practicable (MEP): LNAPL transmissivity can be an indication of whether an MEP endpoint has been reached and may be interpreted within a framework that includes other complementary metrics. Section 1.2 discusses this further. While LNAPL transmissivity is useful for evaluating LNAPL hydraulic recovery potential, it should not be used as a sole means to determine whether an LNAPL remedy for a site is necessary or unnecessary. LNAPL transmissivity does not characterize LNAPL composition concerns (e.g., human health or environmental risk as defined by RBCA ASTM and regulatory programs developed for sorbed, dissolved and vapor phase chemicals of concern). Another constraint is that LNAPL transmissivity is useful as part of an overall LNAPL plume stability evaluation, but a low transmissivity condition does not eliminate potential for sheen generation to a nearby surface water body. The decision on whether to implement an LNAPL remedial action should be based on the broader site LNAPL CSM rather than LNAPL transmissivity alone. 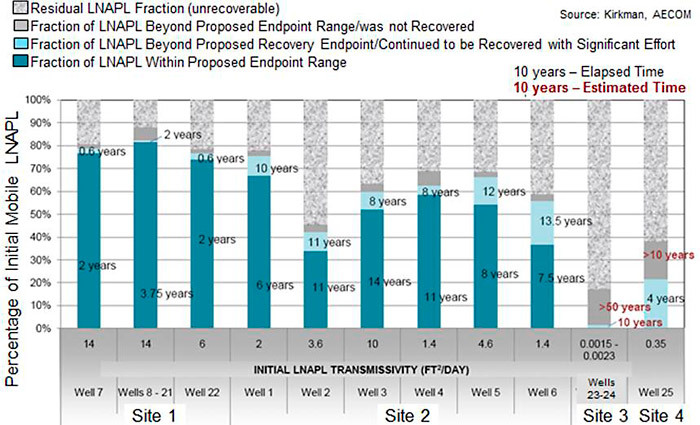 If a decision has been made to pursue LNAPL recovery, LNAPL transmissivity is one of several metrics that can be used to evaluate remediation technology performance. Site conditions and remediation stage dictate whether LNAPL hydraulic recovery, vapor extraction (if applicable), or biodegradation are the dominant mass removal mechanisms. Calculation of mass removal rates using common units (e.g., gallons per acre per year removed) facilitates removal mechanism comparison. If LNAPL mass recovery is ongoing, LNAPL transmissivity can provide a metric to understand remedy progress and define the point at which hydraulic LNAPL recovery is no longer beneficial. LNAPL transmissivity directly varies with LNAPL saturation and thus offers a direct measure of the effect of LNAPL recovery on mobile LNAPL. 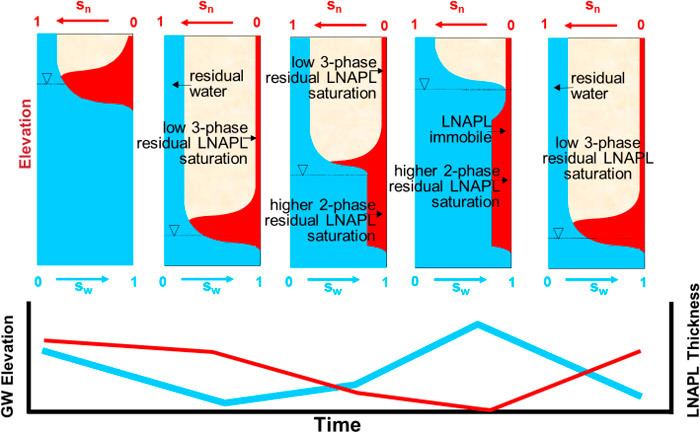 LNAPL transmissivity measures the recoverability of the mobile LNAPL present and provides a metric to measure progress towards residual saturation (defined by zero LNAPL transmissivity). A threshold LNAPL transmissivity value, typically representative of an LNAPL saturation that is nominally above the residual LNAPL saturation for the formation, may be established at the outset of the LNAPL recovery action and used as a trigger for stopping LNAPL recovery. This can be useful as an optimization strategy to discontinue LNAPL recovery from wells or trenches where little recoverable LNAPL is present and focus recovery efforts on locations with higher transmissivity and more recoverable LNAPL. It should be noted that LNAPL transmissivity measurements often vary in both space and time. For example, groundwater fluctuations can occur such that the LNAPL fluctuates from unconfined to confined conditions. In that situation, it may be necessary to measure LNAPL transmissivity values under both conditions. Repeated LNAPL transmissivity measurements may produce consistent values or result in extremes for some sites. In the case of extremes, spatial and temporal averaging of LNAPL transmissivity values can produce a more reliable understanding of LNAPL recoverability for use in site decision making. The LNAPL transmissivity testing and estimation methods presented in the following sections provide a well-established framework to evaluate transmissivity for a wide variety of site conditions. This testing framework has been expanded based on recent experience to properly select and scale the testing and analysis to an individual site. Discussions of specific scenarios have been provided to support application and considerations of LNAPL transmissivity. The United States federal government set an expectation in the Code of Federal Regulations (40 CFR 280.64 subpart F) that at underground storage tank sites where a petroleum release occurred and LNAPL is present, “owners and operators must remove free product to the maximum extent practicable as determined by the implementing agency.” The regulation further states that abatement of free product migration should be used as a minimum objective for design of an LNAPL recovery system. State environmental regulators are typically the implementing agencies and there has been variability in state definitions of MEP. Historically, many state environmental regulatory agencies used de minimus LNAPL thicknesses, e.g., 0.01 foot, in wells as evidence of compliance with the federal MEP mandate. Some jurisdictions allow(ed) a pragmatic definition of MEP based on operation of an intensive LNAPL recovery action to the point that the remediation system was no longer producing meaningful volumes of LNAPL. This approach is effectively a site-specific, empirical definition of recovery to the MEP. presenting information that shows an unreasonable cost per gallon or pound of LNAPL recovered. This section is not intended to be a full discourse on MEP and but rather a discussion of how LNAPL transmissivity can be used for demonstration of compliance with MEP. One meaningful advantage to the use of LNAPL transmissivity in determining compliance with MEP is avoiding implementing recovery actions that will not remove a meaningful amount of the source mass based on industry experience. This is useful if there is an overall objective of maximizing the environmental net benefit in relation to (often limited) remediation resources. The LNAPL transmissivity range of 0.1 to 0.8 ft2/day has been referenced by many site owners and practitioners, and has been incorporated into LNAPL technical guidance by some state environmental regulatory agencies. Given the degree to which this range has been adopted by many stakeholders, the ITRC team has assembled background information on the origin of the 0.1 to 0.8 ft2/day range. The following presents conditions at the sites that were used as the basis for the range. The subsurface consisted of silty clay with sand lenses that contained hydrocarbon impacts based on laser induced fluorescence investigation. Impacted sand lenses frequently occurred below the water table and represented residual and/or confined mobile LNAPL. The mobile LNAPL exhibited LNAPL transmissivity values of 0.1 to 4 ft2/day. LNAPL distribution was understood through soil borings, fluid gauging data and CPT /LIF data. Hydrocarbon fingerprint analysis indicated that the LNAPL was an aged diesel indicating the release was not recent nor likely ongoing at the active facility. LNAPL stability was documented based on delineation activities and over 8 years of monitoring LNAPL extent. The location exhibiting 4 ft2/day LNAPL transmissivity was selected for LNAPL skimming, which was conducted over a 4-year period. LNAPL recovery rates started at 2 gallons per day (gpd) and quickly decreased to less than 0.2 gpd. A total of 215 gallons of LNAPL was recovered over 1,500 days. The API LNAPL Distribution and Recovery model was utilized to forecast LNAPL recovery rates over time for an ideal isotropic condition in a sandy soil (of the same type as the impacted sand lenses). A point representing asymptotic recovery was selected based on 90 percent of the recoverable LNAPL (mobile fraction) being removed in a given time frame that was one-fifth of the time to recover the remaining 10 percent. The remaining 10 percent of mobile LNAPL also represented less than 25 percent of the residual mass in place. The LNAPL transmissivity representative of this asymptote was 0.8 ft2/day. This LNAPL transmissivity value was selected as the endpoint for the site. LNAPL recovery from the fluvial channel depositional-environment reduced LNAPL transmissivity to less than 0.2 ft2/day over the first 4 months of recovery highlighting the limited extent of sand at the site. LNAPL recovery rates remained low and LNAPL transmissivity remained low for the remainder of the 4-year recovery period. LNAPL was perched in gravelly material overlying moist to wet clay. The LNAPL likely occurred in depressions of the clay and distribution centered around the clay surface rather than the water table. Soil core analyses indicated an LNAPL saturation of 0.2 percent of the pore space in the silty clay, confirming that LNAPL impact to the silty clay was minimal. Collection of cores from the overlying gravel was not feasible. Baildown test analysis combined with the soil profile confirmed the perched LNAPL conditions (Kirkman, Adamski, and Hawthorne 2013). Although there was up to 7 feet of LNAPL gauged in wells screened across the gravel and the silty clay, less than 0.5 feet actually occurred as mobile LNAPL in the overlying gravel. Initial LNAPL transmissivity results indicated values of 1.4 ft2/day and skimming recovery rates near 0.8 gpd as a result of the LNAPL occurring in the coarse gravel rather than the silty clay. The water-table occurred in the clay although infiltrating water likely was seasonally perched on the clay or flowed through the gravel. 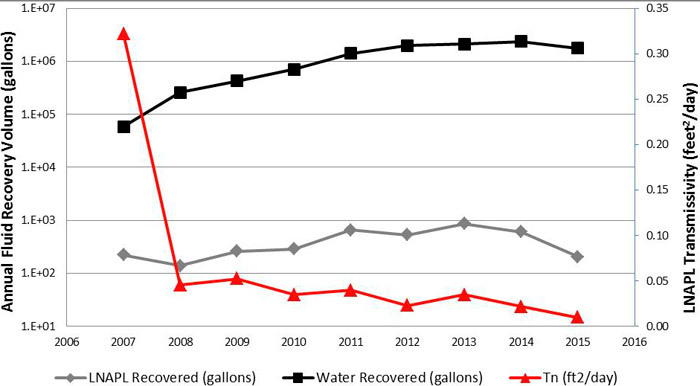 Four years of LNAPL recovery at two well locations resulted in less than 50 gallons of LNAPL removed. Initial LNAPL skimming rates were near 0.5 gpd, and declined to near 0.1 gpd; rates also decreased seasonally to less than 0.001 gpd. Maximum LNAPL transmissivity post recovery was estimated to be 0.4 ft2/day. LNAPL recovery rates were no longer observed to decline following initial 6 months of recovery; rather, seasonal fluctuations occurred. LNAPL recovery and downgradient monitoring confirmed that the LNAPL extent was limited and stable. No impacts to groundwater or other receptors were identified. The overall conceptual model represented minimal mobile LNAPL impacts being stable and occurring in a surficial gravelly unit. Relatively large gauged thicknesses were not indicative of the need for recovery, but rather represented perched LNAPL. LNAPL recovery and soil profiles versus fluid levels confirmed the presence of perched LNAPL. LNAPL recovery rates quickly reached asymptotic conditions, under which skimming was not substantially changing the mobility or overall quantity of LNAPL present. Groundwater and fluid level monitoring identified that the LNAPL was stable and no dissolved phase exceedances were migrating off-site. An agreement was reached with the agency to cease LNAPL skimming and conduct two years of groundwater monitoring, fluid level monitoring and periodic removal. The two years of monitoring confirmed the conceptual model and resulted in closure. Site two is a railroad facility where LNAPL existed in secondary porosity of a fine grained soil based on soil cores and monitoring well gauging data. No dissolved or vapor phase risks were identified related to the LNAPL, which consisted of weathered diesel and lubricating oils. The remedial objective was to prevent LNAPL from reaching and impacting a nearby creek; therefore, LNAPL stability was the primary concern. Occurrences of LNAPL in the creek were historically observed but had not been seen in over a decade. In 2004 the LNAPL body was delineated and LNAPL physical properties measured from soil cores were used to estimate the hydraulic head that would be needed to drive the LNAPL towards the creek. The capillary properties of the soil, accounting for secondary porosity, were used in this calculation, which concluded that 1.5 to 1.9 ft. of hydraulic head would be required to cause LNAPL migration. Neither existing hydraulic head at the LNAPL body (0.64 to 0.05 ft.) nor natural infiltration-based events were sufficient to create a head similar to the required head to displace LNAPL, resulting in the conclusion that LNAPL was stable and would not impact the creek. The site achieved closure based on lack of impacts to receptors, stable LNAPL and lack of recoverability. Several monitoring wells associated with a railroad facility exhibited mobile LNAPL. A multi-phase extraction (MPE) test was conducted over a period of 2 years. The recovery volumes were sufficiently low to demonstrate that LNAPL recovery would not significantly reduce the LNAPL saturation over a 10 year period. The site exhibited stable LNAPL, no dissolved or vapor risks to receptors, and was dominated by residual LNAPL. A report summarizing results demonstrating LNAPL stability, lack of risks to receptors and lack of effectiveness for LNAPL recovery was submitted to the agency requesting a no further action determination, which the agency subsequently granted. As part of development of the LNAPL transmissivity discussion in the 2009 ITRC LNAPL document, the data were reviewed and LNAPL transmissivity values were estimated using equations for MPE data analysis now included as part of ASTM E2856-13 (ASTM 2013). The results indicated that LNAPL transmissivity values were initially 0.1 ft2/day at the start of the MPE program and remained at 0.1 ft2/day at the termination of the program. The lack of change in transmissivity indicates that the two-year MPE test provided no material improvement in site conditions. A railyard exhibiting two areas of mobile LNAPL had been through a corrective action strategy involving periodic LNAPL removal and installation of a recovery trench and vertical wall to prevent seeps to surface water. 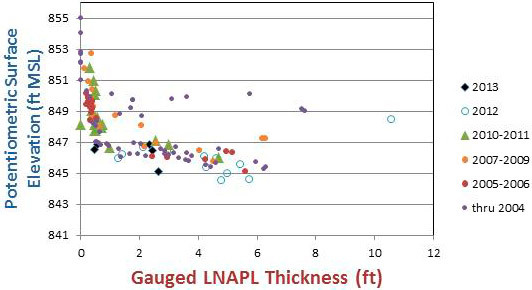 The LNAPL exhibited high viscosity values ranging from 3.75 to 25 centipoise and was representative of a weathered diesel and/or heavier petroleum. Groundwater monitoring had been discontinued, because the degree of weathering resulted in no detections of dissolved petroleum constituents in groundwater. The primary focus of LNAPL management was LNAPL removal to MEP and prevention of seeps to surface water. The first area of LNAPL exhibited LNAPL near a surface water body, and LNAPL transmissivity values were estimated to be on the order of 0.004 ft2/day. LNAPL distribution and recovery modeling was completed to evaluate the potential benefit of a 200 foot long skimming trench, and identified that the bulk of the mobile LNAPL could be recovered in 100 years. If water enhanced LNAPL recovery were implemented, the starting oil to water ratio was estimated to be 1 gallon of LNAPL to 1,000 gallons of water, which is often utilized as an endpoint for this technology rather than an optimal starting point. As LNAPL recovery was demonstrated to be ineffective, a cutoff wall was proposed in this area to ensure LNAPL would never reach surface water. No surface water impacts had previously been identified; however, this measure was implemented as a supplemental measure to prevent LNAPL migration, and provided secondary structural benefit to the railyard facility. The second area of the site exhibited weathered diesel fuel in an area with a shallow water-table dominated by sand with a 1- to 2-inch clay seam. An LNAPL transmissivity test was conducted to evaluate LNAPL recoverability, and resulted in a value of 0.03 ft2/day. An LNAPL distribution and recovery model was calibrated using baildown test results and soil and LNAPL properties. The modeled scenario considered a 100-foot long skimming trench operated at maximum efficiency, and located in the area representing the maximum estimated LNAPL transmissivity value. Model results predicted that 50 years of LNAPL recovery would be required to recover the bulk of the remaining mobile LNAPL. Comparison of LNAPL transmissivity to aquifer transmissivity identified that if water enhanced recovery was utilized the initial oil to water production ratio would be 1:100. This ratio of oil to water would decrease during the life of recovery. The site also did not have existing infrastructure for water treatment. The lack of groundwater impacts, stability of the existing LNAPL in this area and distance to any surface water body or receptors, extended timeframes and large investments required for LNAPL recovery combined with residual LNAPL continuing to remain at the site provided the basis for the site closure. Shortly after the report was submitted, LNAPL thickness began rising in one of the wells in Area 2. Upon review of adjacent cone penetrometer data, the clay seam was identified as potentially confining the LNAPL. A second baildown test was completed in the well when it exhibited the larger thickness. The analysis accounted for the confined LNAPL and resulted in a similar but lower LNAPL transmissivity value. The visualization of the soil profile adjacent to fluid levels identified the confined conditions and explained why the thickness rose with an increase in the water table. The second baildown test provided sufficient evidence that LNAPL was stable, not increasing in impact, and LNAPL remained non-recoverable. An active petroleum facility had LNAPL in more than 50 wells where vacuum truck liquid recovery or skimming had been performed for over 20 years. The LNAPL occurred in silty sand layers confined by finer clays in an alluvial depositional environment. Although the wells accumulated LNAPL to thicknesses on the order of 4 feet or more, LNAPL transmissivity at those wells was consistently less than 0.8 ft2/day, with some transmissivity results up to 2 orders of magnitude lower than that value. Historical LNAPL recovery data were presented to illustrate the decline in LNAPL recovery that had occurred; current recovery efforts were not producing significant volumes compared to past recovery. Ten additional years of LNAPL recovery would produce less than ten percent of the historically recovered LNAPL volumes. Soil core and laser induced fluorescence data as compared to fluid levels illustrated that the majority of the LNAPL was residual and not mobile. LNAPL transmissivity values were used to forecast future recovery, which would have addressed a small fraction of remaining impacts at low rates. In 2009, agreement was reached with the agency that LNAPL recovery was no longer beneficial. This redirected the site focus towards technologies that would address groundwater impacts. LNAPL plumes were stable and delineated and generally were within the current facility property. There were no risks to receptors—rather than postponing risk-based decision making after LNAPL had been removed from wells, risks were evaluated concurrently with LNAPL removal. Volumes of LNAPL that were reasonably recoverable represented a small part of either the overall mass at the site, or the historically recovered LNAPL mass; future recovery of mobile LNAPL would reduce the LNAPL mass at the site by only a small amount. LNAPL transmissivity values had been reduced to values below 0.8 ft2/day with recovery, or initially existed at values of 0.1 ft2/day or lower. Gauged LNAPL thickness was not a primary criterion in demonstrating LNAPL recoverability or the potential benefit of LNAPL recovery. 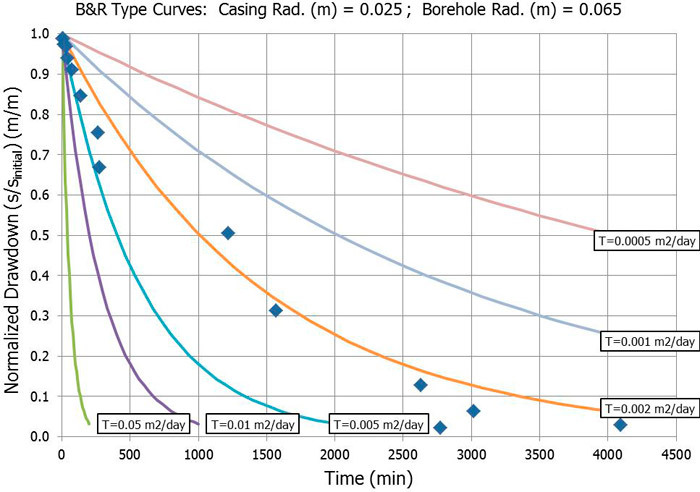 Since the range of 0.1 to 0.8 ft2/day was presented by ITRC (ITRC 2009a), additional sites have used similar methods to determine the limits of hydraulic LNAPL recovery. Figure Tn-1 presents the empirical data from sites that were intensively studies to support the statement above. LNAPL recovery data from 11 different hydraulic recovery systems at four sites was analyzed. Site 1 represents a sand and gravel aquifer with hydraulic conductivity values on the order of 300 ft/day. Site 2 represents a medium sand of 30 ft/day conductivity that transitions into silt. Site 3 represents a silty sand exhibiting hydraulic conductivity near 3 ft/day, and Site 4 represents a sandy silt exhibiting less than 1 ft/day hydraulic conductivity. The y-axis of Figure Tn-1 represents the fraction of LNAPL mass removed from the mobile interval after various time intervals of recovery operation. At the start of recovery, some fraction of mass was recoverable and some fraction was residual. Each data column represents recovery from a given well or group of wells. The number along the x-axis under each column represents the starting (baseline) LNAPL transmissivity. As LNAPL recovery operation progressed, the fraction of LNAPL recovered at systems with initial LNAPL transmissivity values above 0.3 to 0.8 ft2/day is represented in dark blue. Each of these dark blue bars is labelled with the time it took to achieve this recovery. The light blue represents the additional recovery achieved when the LNAPL transmissivity fell below 0.3 to 0.8 ft2/day along with the corresponding time. The solid gray represents the estimated remaining mobile LNAPL fraction. The marbled gray represents the residual mass remaining based on soil cores and soil TPH samples and use of an f-factor to estimate residual LNAPL. Figure Tn-1: Fraction of LNAPL recovered above 0.3 to 0.8 ft2/day. As Sites 3 and 4 never exhibited LNAPL transmissivity values above 0.8 ft2/day, there are no dark blue bars and the majority of LNAPL was residual at the start of recovery. For Sites 1 and 2, at the point where LNAPL transmissivity fell into the range of 0.3 to 0.8 ft2/day, as indicated by the short light blue bars and often long durations, the majority of the mass was residual and continued recovery did not produce significant volumes of LNAPL relative to past volume recovered. The recent site analyses affirmed the initially proposed transmissivity range of 0.1 to 0.8 ft2/day. LNAPL transmissivity is fundamentally a description of the relationship between LNAPL drawdown (or gradient) and LNAPL discharge (or flow). As such, most field test methods involve inducing an LNAPL drawdown at a well and measuring LNAPL discharge from the formation to that well. Field testing that correlates the volumetric rate of LNAPL discharge from the formation to LNAPL drawdown or the volume of water and LNAPL during pumping is the preferred way to measure LNAPL transmissivity. Both qualitative and quantitative methods for collecting and using field data to assess LNAPL transmissivity are presented in this section. Purging LNAPL from a well and monitoring how quickly LNAPL returns to a well has been used for decades to assess LNAPL recoverability. It is intuitive that if the LNAPL returns quickly the LNAPL is more recoverable than if it recharges very slowly or does not recharge at all. It has become common to collect LNAPL recharge data over time in order to calculate LNAPL transmissivity, which is covered in the next section. The Minnesota Pollution Control Agency (MPCA) has a structured approach to using qualitative recoverability data. The guidance provided by the MPCA states that if LNAPL in a well is purged, and less than one gallon of LNAPL recovers into the well within 24 hours; and if a repeat test shows the same recovery or lower; then LNAPL recoverability is considered low and automated LNAPL recovery methods are considered ineffective. The MPCA approach is worthwhile for comparative behavior of LNAPL in wells. When considering a test represented by static potentiometric surface, the value of 1 gallon per day via bailing or skimming correlates well with the LNAPL transmissivity range of 0.1 to 0.8 ft2/day presented in (ITRC 2009a). Given an LNAPL transmissivity of 0.8 ft2/day and a similar skimming drawdown, 0.2 ft., as would be induced in baildown tests, the expected LNAPL recovery rate would be approximately 1.6 gallons per day. The MPCA method is useful for a broad range of sites because of the simplicity of the approach. However, it is difficult to utilize this method to project performance of an MPE or water enhanced recovery system, or for assessing LNAPL recovery performance for alternate technologies. Three testing methods are commonly used to measure LNAPL transmissivity. The data collection and data analysis procedures for these LNAPL transmissivity measurement methods are discussed in detail by ASTM E2856-13: ASTM Standard Guide for Estimation of LNAPL Transmissivity (ASTM 2013). LNAPL Baildown Testing: An LNAPL baildown test is initiated by quickly removing accumulated LNAPL from a well. The rate of LNAPL flow into the well is a function of soil and LNAPL properties discussed above and the magnitude of the initial hydraulic gradient toward the well developed during LNAPL removal. The LNAPL discharge into the well is related to the LNAPL drawdown (both decrease during the test) to calculate LNAPL transmissivity. The baildown test response is influenced by prevalent fluid levels at the time of testing. Multiple baildown tests can be performed at a site to describe the range of LNAPL transmissivity values under different fluid-level conditions. Manual LNAPL Skimming Testing: Manual LNAPL skimming tests involve repeated LNAPL recovery periods relative to baildown testing (which consists of one near-instantaneous LNAPL removal at test initiation), and thus represent a larger portion of the LNAPL-impacted formation. A manual skimming test consists of removing all LNAPL from a well, gauging the well as the LNAPL recharges, and repeatedly removing LNAPL before the recharge reaches 25 percent of pre-test LNAPL thickness. This process continues until the LNAPL removal rate stabilizes. The steady-state LNAPL discharge observed towards the end of the test is related to the induced drawdown to calculate LNAPL transmissivity. LNAPL Recovery System Evaluation: This evaluation is commonly completed on historical LNAPL recovery system data, but it is becoming more common to configure new LNAPL recovery systems or retrofit existing LNAPL recovery systems to generate data that can be used to track LNAPL transmissivity over time. Multiple equations have been derived to calculate LNAPL transmissivity for LNAPL-only recovery, LNAPL and groundwater recovery, and multiphase (LNAPL, groundwater, and soil gas) recovery. For remedial systems operated over longer time frames, the average LNAPL volumetric recovery rate is related to the LNAPL drawdown induced by the extraction of fluids from the subsurface. An element of the LNAPL Recovery System Evaluation approach in the ASTM guide is estimation of LNAPL transmissivity from the ratio of groundwater and LNAPL extracted from a well. This approach is easily calculated if the water drawdown induced during pumping is larger than 10 times the available LNAPL drawdown, but may also be calculated where this ratio threshold is not met (ASTM 2013). The oil/water ratio analysis can be applied to data collected during a short or long-term pumping test. A typical short-term oil/water ratio test might consist of pumping both LNAPL and water from a well for a period of several minutes to hours, with a pump intake set well below the mobile LNAPL interval, and measuring the ratio of LNAPL and water either through periodic samples or through observation of the collected liquids at the conclusion of the test. The oil/water ratio analysis can improve upon other transmissivity estimation methods when gauged LNAPL thickness is low and drawdown is similar in magnitude to gauging precision (e.g., 0.01 ft.) or where water tables exhibit frequent fluctuations such as tidally influenced cycles. A fourth method that is less commonly performed is LNAPL Dye Trace Testing (ASTM 2013). A fluorescent dye that dissolves in petroleum but is not water soluble is added to LNAPL in a monitoring well. The dye concentration in the LNAPL in the well is measured over time and the rate of concentration decrease is used to calculate the LNAPL flux through the well. The time-averaged LNAPL transmissivity can be calculated from the LNAPL flux using site-specific data. This test is unique among transmissivity test methods because it measures LNAPL flow under ambient conditions (rather than an induced gradient); therefore, it can also be helpful for assessment of LNAPL mobility. Data collection and analysis methods for LNAPL Dye Trace Testing are also presented in the ASTM guide. These approaches to LNAPL transmissivity measurement provide a sufficient degree of accuracy to characterize recoverability, changes in recoverability with remediation, and to calibrate models for forecasting LNAPL distribution and recovery performance. Comparative studies of multiple LNAPL transmissivity measurement techniques at the same location have shown that the different test methods generate similar results (Palmier et al. 2000); (Kirkman 2013). LNAPL recharge behavior observed during baildown tests can be used as a diagnostic to determine whether LNAPL is unconfined, perched, or confined (Kirkman, Adamski, and Hawthorne 2013). When multiple tests are conducted at different locations, the influence of geologic heterogeneity is incorporated into the transmissivity results. Field testing can also be repeated to quantify the range of LNAPL transmissivities that may be observed due to water table fluctuations increasing the overall confidence in the transmissivity data. There are several methods to estimate LNAPL transmissivity. Selection of the appropriate field testing and data analysis approach is a function of how the transmissivity values will be used. A simple approximation of LNAPL transmissivity using known site parameters may be sufficient to support LCSM development for an LNAPL with small LNAPL thicknesses while a precise field-based method of determining LNAPL transmissivity would be appropriate for LNAPL model calibration at a site where LNAPL appears to be readily recoverable. The ASTM Standard Guide for Estimation of LNAPL Transmissivity (ASTM E2856-13) provides data collection and data analysis procedures for estimating LNAPL transmissivity from baildown tests, manual skimming tests, LNAPL recovery system data, and LNAPL dye trace testing. API published an LNAPL Transmissivity Workbook (API Workbook) and companion user’s manual that provides a spreadsheet-based user-friendly method to calculate LNAPL transmissivity from baildown test data (API 2016). The API Workbook is consistent with the data analysis practices in ASTM E2856-13. The transmissivity data collection and analysis methods presented in ASTM E2856-13 were designed to provide a high degree of rigor for the purpose of ensuring that the LNAPL transmissivity values measured using the ASTM method represented current best practices (ASTM 2013). It was realized that compliance with the ASTM standard cannot be consistently achieved at all sites and may not be necessary for all sites. This section describes simplified methods that can provide approximations of LNAPL transmissivity. LNAPL transmissivity can be estimated from Darcy’s Law, with a correction to the water hydraulic conductivity to account for the difference in fluid properties between the LNAPL being considered and groundwater. This approach is a theoretical exercise and it should not be expected that the result of this calculation will match field tests that measure LNAPL transmissivity. Field tests inherently account for deviations from theory and account for multiphase fluid flow. However, this calculation method may provide an estimate of LNAPL transmissivity that is useful to understand what LNAPL transmissivity may be at a site where additional field data collection is deemed unnecessary. The groundwater density and viscosity are assumed to be 1 gram/liter and 1 centipoise, respectively, at 20 degrees Celsius. It is preferential for the data used in the calculation, with the exception of the groundwater density and viscosity, to be site-specific parameters. The LNAPL density can be determined in the field using a hydrometer or through laboratory analysis. LNAPL viscosity measurement is typically conducted in an analytical laboratory. The water hydraulic conductivity can be determined via slug testing, pump testing, or another suitable method. However, several sources provide LNAPL density and viscosity data for unweathered crude oils and refined petroleum products, and representative water hydraulic conductivities can be selected based on an understanding of the soil type where the LNAPL resides. The simplest direct calculation of LNAPL transmissivity is based on an assumption that LNAPL fills all soil pores within the mobile LNAPL zone and where the LNAPL relative permeability is one. This calculation is considered to be conservative because LNAPL does not reach 100 percent saturation at environmental sites. This conservative calculation can be useful for sites where the LNAPL thickness is very small and field testing is neither practical nor considered necessary. LNAPL transmissivity can also be calculated with an additional correction for the fact that LNAPL does not fill all soil pores at an environmental site (relative permeability is less than one). Within the saturated zone, LNAPL fills only a portion of the pore space. Groundwater and, in some cases, trapped gasses fill the remaining pore space. Groundwater cannot move through LNAPL-filled pores and LNAPL cannot move through groundwater-filled pores. The reduction of available pore space for liquid flow is equivalent to a decrease in the permeability of the formation. Multiphase flow calculations include a relative permeability term, which ranges from 0 to 1, to account for this decrease in soil permeability. While a relative permeability term is useful to decrease the degree of conservativism in the Darcy’s Law calculation, there are no simple methods to estimate relative permeability without conducting field LNAPL transmissivity tests or collecting soil samples for lab analysis of petrophysical properties. In light of this limitation, an analysis of LNAPL transmissivity data that were collected by API from member companies and compiled in a database was completed to determine a representative range of LNAPL relative permeability values. Ninety-four unique LNAPL transmissivity measurements that were entered in the database included sufficient ancillary site data to calculate relative permeability near the test well. Ninety percent of the relative permeability values were below 0.28; 80 percent were below 0.09. The API data are provided as a potential basis for selection of a relative permeability value that represents the degree of conservatism that is appropriate for the site setting and conditions. The relative permeability may also be estimated from fluid retention models as described in API LDRM model (API 2007). When LNAPL discharge into a well during a baildown test does not follow ideal hydraulic response patterns, it is not possible to accurately estimate Tn using conventional methods. In these cases it may be reasonable to approximate LNAPL transmissivity through visual inspection of the recovery data versus an idealized hydraulic response. The API Workbook can be used to generate Bouwer and Rice type curves that show idealized LNAPL drawdown as a function of time. Note that a test-specific J-ratio term must be established in the workbook to support this approach. The user’s guide for the API Workbook provides direction on how to set an appropriate J-ratio. An example of the use of the Bouwer and Rice type curves for determination of LNAPL transmissivity is shown on Figure Tn-2. In this case inspection of where the data plot on the graph indicates that the LNAPL transmissivity is between 0.002 and 0.005 meters2/day. The Bouwer and Rice analytical calculation for these data was 0.003 meters2/day. All of the data points are to the left of the 0.005 meters2/day curve and it would be accurate to state that the LNAPL transmissivity is less than 0.005 meters2/day. For a theoretical scenario where an LNAPL transmissivity threshold of greater than 0.01 meters2/day had been established for initiating LNAPL recovery, this approach would provide a high degree of certainty that the transmissivity was less than the threshold value. While this method for determining LNAPL transmissivity is straightforward, it can produce erroneous results. (Kirkman, Adamski, and Hawthorne 2013) demonstrated that while an estimate of LNAPL transmissivity can be made via type curves, those type curves rely on an accurate identification and elimination of the initial drawdown data, which is often higher than the formation response due to filter pack recharge effects. If the filter pack recharge data are dominant within the data set, possibly due to incomplete LNAPL purging, this approach could in overestimation of LNAPL transmissivity. Figure Tn-2. Normalized drawdown data from a baildown test plotted with Bouwer and Rice type curves generated for the test well. As LNAPL transmissivity has become more widely used and more frequently measured, several common challenges or complicating factors have emerged in transmissivity measurement. For example, at monitoring wells with small equilibrium in-well LNAPL thicknesses, LNAPL baildown testing involves significant uncertainty and is generally not recommended (ASTM 2013). A few frequently encountered challenging scenarios are summarized in the following table, along with potential solutions or suggestions to mitigate challenges. How should field activities be adjusted to get a more reliable Tn result? Fluctuating water table during testing creates uncertainty in LNAPL drawdown Tidal fluctuations, weather-related/regional influences Consider oil-water ratio tests (which can induce additional drawdown and reduce significance of ambient fluctuations) or qualitative measurements. Consider using early-time data to generate an approximate or upper-bound result. Consider using data to estimate an upper-bound transmissivity result, even if data appear to represent filter pack recharge only. Evaluate data using Bouwer & Rice type curves to develop an upper-bound result. Consider redeveloping wells and re-testing, noting that significant time may be required for re-equilibration. Consider estimating maximum theoretical LNAPL transmissivity at 100% LNAPL saturation, using LNAPL viscosity data and Darcy’s Law relationships described in Section 3.2.1 of this Appendix. For high viscosity NAPL, consider using empirical data or desktop calculations. For emulsions or optically challenging NAPLs, consider using pressure transducers or other automated measurement solutions. Consider oil-water ratio tests where total fluids can be pumped from the test well and measured ex situ, with additional separation or settling time and/or different measurement methods. Consider oil-water ratio tests where total fluids can be pumped from the test well and measured ex situ, with greater precision than down-well measurements. As LNAPL transmissivity has been more broadly adopted as a tool for site evaluation, in-well LNAPL thickness, which was historically often relied upon as an indicator of the magnitude of LNAPL impact, has generally become less significant. However, in-well LNAPL thickness and the relation to the surrounding mobile LNAPL interval in the formation is still an important component of the LNAPL conceptual site model. Additionally, the relationship of in-well LNAPL thickness to LNAPL transmissivity results can highlight important considerations or cautions related to LNAPL transmissivity and LNAPL hydrogeologic conditions. The following table summarizes general inferences that may be drawn from relationships between LNAPL transmissivity and in-well LNAPL thicknesses. High High Recoverability may be good; consider targeting this location if needed to reach saturation objectives. Low LNAPL may be present in a confined or perched conditions or in fine-grained soils with a small mobile LNAPL interval. The large thickness in this case is observed only because the well is present and providing hydrostatic relief. Low High Carefully evaluate LNAPL drawdown, which is a sensitive parameter for Tn. Measurement error for drawdown may be relatively large at small LNAPL thicknesses. Consider qualitative Tn test methods or oil-water ratio testing to reduce sensitivity to drawdown. Low Recoverability is likely low; however, as with other low-thickness conditions, confirm LNAPL drawdown is accurately measured. LNAPL transmissivity has direct application to recovery system design, and can be used to estimate LNAPL recovery rates and compare potential recovery approaches. The following case study of a site where LNAPL recovery was needed to reach LNAPL saturation objectives describes ways that LNAPL transmissivity data can be used for LNAPL recovery system design. The study site is a natural gas plant where a gas condensate release was identified during routine pipeline maintenance. Soil near the release area was heterogeneous with interbedded coarse-grained and fine-grained soils. Water-saturated hydraulic conductivities at the site range from 10-3 to 10-4 cm/sec, which are consistent with silty sands and fine sands. The average hydraulic gradient is 0.003 foot per foot. The natural gas condensate was found to be leaking from a buried pipeline. The pipeline was repaired and the there is no longer an ongoing release. The natural gas condensate has a low density (0.701 grams per cubic centimeter) and low viscosity (0.504 centistokes). The horizontal and vertical extent of LNAPL was investigated using laser-induced fluorescence, photoionization detector screening of soil cuttings, and visual observations in soil borings and monitoring wells. During the initial investigation, LNAPL transmissivity testing was conducted using short-term test methods. An LNAPL baildown or manual skimming test was conducted at three monitoring wells located adjacent to the source (monitoring well (MW)-1), downgradient of the source (MW-2) and at the leading edge of the LNAPL body (MW-3). Baildown tests were attempted and failed at MW-1 and MW-2 because LNAPL recharge was rapid and exceeded the maximum flow rate of the pump used to purge LNAPL. In response to this observation, modified skimming tests were conducted. As before, the LNAPL recharge rate was rapid, and only minimal LNAPL drawdown in the well could be achieved. The initial investigation calculated that transmissivities for wells MW-1 and MW-2 were subject to a high degree of uncertainty due to the minimal drawdown. To reduce this uncertainty, and provide greater accuracy to support LNAPL recovery system design, a LNAPL pumping test was pursued. A series of 10-hour LNAPL pumping tests were completed at MW-1, MW-2, and MW-3 to more accurately determine LNAPL transmissivity and sustainable LNAPL recoverability for designing interim and longer-term LNAPL recovery at the site. This longer-term test (10 hours) approximated steady state LNAPL flow to the well, resulting in a more accurate estimate of LNAPL transmissivity. LNAPL pump tests were completed in general accordance with the manual skimming protocol included in the ASTM E2856-13, with the goal of achieving a consistent LNAPL drawdown with a stable, continuous LNAPL extraction rate for the duration of the test. Based on the initial LNAPL transmissivity testing, an appropriately sized pump was selected to maintain an LNAPL thickness in the well of no greater than 25 percent of the measured thickness. Pump intakes were placed within the accumulated LNAPL, approximately 0.5 feet above the potentiometric surface, to avoid recovery of groundwater. LNAPL thickness was continuously monitored in the early stages of the test, and LNAPL pumping rates were manually adjusted to reach a stable LNAPL drawdown. LNAPL transmissivity was calculated following Equation 16 of ASTM E2856-13 (ASTM 2013). Results for the LNAPL pump tests are summarized in Table Tn-4. The results of the LNAPL transmissivity testing were used to develop an LNAPL recovery action designed to recover mass, reduce LNAPL saturation, and mitigate LNAPL migration. Results from the LNAPL transmissivity testing were incorporated into the recovery system design, and informed the recovery method, well density and location, pump and pipe sizing, and recovered LNAPL handling requirements. Because LNAPL transmissivity values vary spatially and there is significant heterogeneity at the site, short-term pump tests were conducted at each recovery well that was installed to verify potential recovery rates and design aspects. Incorporating LNAPL transmissivity prior to remediation design resulted in appropriate sizing of the remediation system, supported logistics planning, and developed baseline transmissivity values that can be used to track remedy progress. the vertical interval of mobile LNAPL in the formation. The fact that LNAPL transmissivity is inclusive of each of these parameters makes it a useful metric for assessing LNAPL recoverability, as it is directly proportional to recoverability under the ambient conditions during the time of testing. However, it is important to acknowledge that the parameters affecting LNAPL transmissivity can vary temporally under certain conditions, resulting in a corresponding temporal variability of LNAPL transmissivity. While aquifer matrix properties are typically assumed fixed, LNAPL properties and relative permeability to LNAPL often vary over time. For example, the physical properties of petroleum LNAPLs can be altered as the result of NSZD processes. These effects tend to increase the viscosity of LNAPLs, leading to a gradual decrease in LNAPL transmissivity. LNAPL saturation at a given location can also vary over time and space as the result of engineered LNAPL remediation efforts, NSZD processes, or redistribution of LNAPL through vertical and/or horizontal migration. In the early stages of LNAPL body development following a release, LNAPL saturation will increase near the leading edge of the LNAPL body and decrease in the area of the release. As LNAPL spreads into previously non-impacted formation materials, an increasing fraction of the LNAPL is trapped as a discontinuous non-wetting phase by capillary forces (becoming residual LNAPL). Thus, as the LNAPL body spreads or moves, an increasing volume of LNAPL becomes residual over time, resulting in an overall decrease in the volume of mobile LNAPL distributed over a larger volume of the subsurface. Beyond the point where lateral LNAPL migration has ceased, water table fluctuations may continue to alter the interval of mobile LNAPL in the formation. Residual LNAPL saturation is generally higher under water saturated conditions (where LNAPL and water completely fill the pore space, and LNAPL is the non-wetting fluid phase) than unsaturated conditions (where pore space is occupied by water, LNAPL, and air, and LNAPL has intermediate wettability). As a result, LNAPL can transition from residual to mobile (or vice versa) as the water table rises and falls. Fluctuating water levels are commonly observed in response to seasonal recharge patterns, or in some cases due to tidal influences, construction dewatering, or changes in nearby groundwater pumping schedules. Where LNAPL is present in the zone of water table fluctuation, the vertical redistribution of LNAPL will result in a corresponding temporal variability in LNAPL transmissivity. The impact of water table fluctuations on LNAPL recoverability should be evaluated on a site-specific basis to determine appropriate test methods, number of locations to be tested, and frequency of testing (Kirkman 2013). Case study examples of how LNAPL transmissivity was evaluated at sites with temporal variability in LNAPL transmissivity due to water table fluctuations are provided below. The case study site is near a tidally influenced river, and groundwater fluctuations are common at wells with LNAPL. During a typical tidal cycle the measured LNAPL thickness varies from near-zero to 2-3 feet. The water table fluctuations create a change in the vertical LNAPL saturation profile as shown in Figure Tn-3, where high water tables trap LNAPL in the formation and low water tables result in vadose zone drainage and increased LNAPL saturation in the mobile interval. Figure Tn-3: LNAPL saturation profile variability under fluctuating water tables. Conducting a baildown test under tidal cycles is complicated by the water table fluctuation. ASTM recommends baildown tests only if the LNAPL recovers fully during the low tide. However, this will likely over-predict LNAPL recovery, as the result represents only a fraction of the day when LNAPL transmissivity is highest. In contrast, manual skimming tests conducted over a full tidal cycle may produce a more a representative result and capture how the LNAPL transmissivity varies over the cycle. The average LNAPL transmissivity over the tidal cycle is more representative of overall site conditions and more valuable to remedial decision making. Therefore, instead of low-tide or high-tide baildown tests, results of manual skimming tests conducted across full tidal cycles (which provide temporally averaged measurements) were used to project potential LNAPL recovery rates and evaluate LNAPL recoverability relative to established metrics. Much like tidal cycles, seasonal groundwater fluctuations can create significant variations in LNAPL transmissivity. At a railroad facility in the Midwest, site groundwater elevations are affected by an adjacent river, and up to 15 feet of seasonal groundwater elevation fluctuation has been observed at the site. LNAPL transmissivity was measured across a range of groundwater elevation conditions to understand seasonal variability. Additional testing is underway to collect results reflecting the full range of groundwater elevation conditions. A time-weighted average LNAPL transmissivity will be calculated, with each LNAPL transmissivity result for a given well weighted based on the fraction of the year that the related groundwater elevation condition occurs. This time-weighted average will be compared to a 0.8 ft2/day LNAPL transmissivity standard in regulatory guidance published by the state environmental agency. This averaging approach has been discussed in concept with the state environmental regulator, but has not yet been officially endorsed. In the case of an active recovery system, if the proper data are collected, LNAPL transmissivity can be calculated and tracked on a much greater frequency (e.g., with daily or weekly recovery totals). At the example site, a dual-phase (total fluids pumping) recovery system is operated continuously and LNAPL transmissivity is tracked weekly. The prescribed endpoint for LNAPL recovery is an LNAPL transmissivity of 0.8 ft2/day, and recent measurements show that LNAPL transmissivity values are fluctuating about that endpoint week to week. The overall trend indicates LNAPL transmissivity decreased from 10 to below 0.8 ft2/day; however, as a consequence of the fluctuations in LNAPL transmissivity around the threshold value established for the site, system operation continues. In this case, averaging the LNAPL transmissivity over a longer period (such as one month) or using trendlines fitted to the weekly data are reasonable approaches to develop an appropriate value for comparison to remedial goals. Short term transmissivity tests such as baildown and manual skimming tests evaluate LNAPL transmissivity by purging LNAPL from a well and observing the hydraulic response over the course of hours or days. In contrast, long-term recovery data represent sustained hydraulic recovery dynamic equilibrium conditions that reflect a larger radius of influence around a well than short-term test methods. Correspondingly, the average LNAPL transmissivity value calculated from long-term recovery data represents a larger volume of the subsurface than short-term test methods and better accounts for subsurface permeability and/or LNAPL saturation heterogeneities. Consequently, short-term testing methods are precise point measurements while long-term recovery data measurements represent more accurate large-scale measurements. It is possible to estimate LNAPL transmissivity values from recovery data for individual wells or trenches, groups of wells or trenches, or entire hydraulic recovery systems. As LNAPL is recovered from the subsurface, the LNAPL saturation decreases and it is expected that the LNAPL transmissivity will decrease as a result. An analysis of LNAPL transmissivity over time can provide a gauge of the progress towards completion of hydraulic recovery. The benefit to using LNAPL transmissivity as compared to tracking LNAPL recovery volumes is that LNAPL transmissivity can normalize changes in system operation that may result in increased LNAPL production. For example, if the overall pumping rate for a combined groundwater and LNAPL recovery system were increased, the volumetric rate of LNAPL recovery will likewise increase. However, an oil/water ratio analysis will show that the LNAPL transmissivity did not change and may show that the increased pumping rate results in a faster decrease in LNAPL transmissivity over time compared to the lower pumping rate. 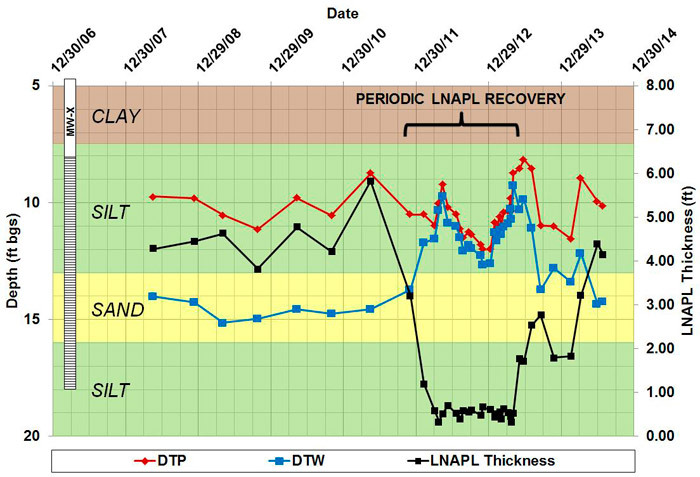 An example transmissivity evaluation for an LNAPL recovery system showing recovery progress over time is presented in Figure Tn-4. The graph shows LNAPL and groundwater recovery trends over time for an LNAPL remediation system that was operated for eight years at a rail yard. There was a steady increase in the volume of both groundwater and LNAPL recovered at the site as a result of upgrades to groundwater treatment system equipment and improved management of system and well fouling. The LNAPL recovery profile shows that LNAPL recovery peaked in 2013 as a result of these efforts. However, the LNAPL transmissivity curve shows that the LNAPL transmissivity was decreasing throughout operation of the remediation system. Figure Tn-4: LNAPL transmissivity and LNAPL and groundwater recovery volumes for a total fluids recovery system. While LNAPL transmissivity is an excellent parameter to trace recovery system performance, additional lines of evidence may be useful to round out the evaluation. Complementary analyses include decline curve analysis, modeling of sustainable recovery curves, and calculation of specific LNAPL volume reductions as a result of LNAPL recovery. Figure Tn-5 provides an empirical example of why LNAPL transmissivity is a better metric than using the thickness of LNAPL accumulation in wells for evaluating LNAPL recovery performance. The graph presents 10 years of vacuum truck recovery at an LNAPL site with little to no change in thickness as a result of recovery efforts. The dominant factor for LNAPL thicknesses illustrated by these data is the potentiometric surface elevation. If the LNAPL thickness was affected by the ongoing recovery action, a clear trend of smaller LNAPL thicknesses over time would have been observed, which would have resulted in clustering of early time data on the right side of the graph and late time data on the left. Figure Tn-5: Gauged LNAPL thickness vs. potentiometric surface elevation through time (Kirkman, Adamski, and Hawthorne 2013). LNAPL transmissivity can be used as a line of evidence to assess the overall stability and migration potential of an LNAPL body, supporting other evaluations based on time-series fluid level measurements and dissolved-phase concentration trends. Stability and migration potential are controlled by hydraulic gradients and LNAPL hydraulic conductivity, rather than the related concept of LNAPL transmissivity. LNAPL conductivity is governed by similar parameters (LNAPL saturation, LNAPL physical properties, and soil permeability), but does not incorporate the vertical thickness component of LNAPL transmissivity, making it suited to evaluate LNAPL migration potential rather than LNAPL recovery potential. LNAPL conductivity values can be calculated from transmissivity results, and it is also possible to directly measure LNAPL flux under ambient conditions through LNAPL tracer testing. An example use of transmissivity testing methods for evaluation of LNAPL body stability is provided below. MW-1: Negligible LNAPL recharge occurred over a period of 5 days – Tn could not be well-quantified by baildown tests, but is qualitatively very low. Based on these results, migration potential in the area of MW-1 was interpreted to be minimal; however, questions remained regarding the overall stability and migration potential of LNAPL in MW-2 and MW-3. To supplement the baildown test results, LNAPL dye trace tests (tracer tests) were conducted in each of the three wells containing LNAPL. The velocity estimates developed from tracer testing results are based on actual LNAPL flow, but do not account for NSZD mechanisms that are likely occurring around the perimeter of the LNAPL body, acting to reinforce overall LNAPL body stability. Therefore, the results should be considered a local measurement within the core of the area of mobile LNAPL, rather than a representative velocity for the LNAPL body as a whole. Flux measurements can also be combined with NSZD measurements to demonstrate overall LNAPL body stability following the approach of (Mahler, Sale, and Lyverse 2012). Overall, review of these site data indicate that LNAPL transmissivity results correlate well to LNAPL mobility, and initial baildown test results could be used as a preliminary line of evidence to evaluate mobility and stability; however, by incorporating additional measurements and lines of evidence, including the LNAPL tracer testing method, an improved understanding of both LNAPL transmissivity and overall LNAPL body stability were developed. Several of the other case studies presented in this Appendix focus on aspects of LNAPL transmissivity application that are relevant to larger sites—for example, evaluation of data from large recovery systems. The following example (Figure Tn-6) presents an application of the same LNAPL transmissivity concepts to a site with a small LNAPL footprint. The example site is a former service station and truck stop located in an area of commercial development that operated from the early 1980s through the mid-1990s. USTs previously used for storage of gasoline and diesel fuel were removed from the site in the late 1990s, and the site has been vacant since. Impacts to soil were noted during removal of a diesel UST, and a series of soil borings and monitoring wells installed in the late 1990s and early 2000s served to delineate the extent of diesel impacts in the subsurface. LNAPL accumulations were observed in as many as eight monitoring wells in an area of approximately 0.5 acres surrounding a former diesel UST. Various LNAPL recovery technologies, including periodic removal technologies (manual bailing, vacuum truck extraction, and deployment of sorbent socks) and belt skimmers were implemented at the site from 2001 through 2005 in an attempt to reduce LNAPL thickness in wells to less than 1/8-inch, in accordance with regulatory policy. A total of approximately 500 gallons of LNAPL was recovered; however, LNAPL accumulations were still routinely observed in four monitoring wells at the site. Figure Tn-6. Fluid levels and LNAPL thickness in MW-X before, during, and after periodic LNAPL recovery was conducted. DTP = Depth to Product, DTW = Depth to Groundwater. LNAPL removal activities were temporarily halted from 2005 through 2011; however, fluid level gauging and groundwater monitoring activities continued on a biennial schedule. During this time, groundwater sampling results indicated stable to decreasing dissolved phase concentrations of TPH-D and naphthalene in wells surrounding the LNAPL source zone. This data, along with the observation that sentinel wells installed around the perimeter of the LNAPL body remained free of LNAPL, provided compelling evidence that the LNAPL body was stable and not migrating. However, LNAPL accumulations in one well (MW-X) reached a thickness of nearly six feet, which raised concerns that LNAPL migration could be occurring. Between December 2011 and August 2013, monthly LNAPL bailing was resumed in an effort to halt any potential LNAPL migration. While LNAPL thickness was maintained at approximately 0.5 ft., there was no evidence of any further progress toward the 1/8-inch criterion. Beginning in 2013, a more informed approach to LNAPL management was adopted including LNAPL transmissivity testing, which at well MW-X was less than 0.1 ft2/d. Evaluation of historical soil boring logs and review of historical fluid level gauging data from 2008 through 2011 using up-to-date analysis approaches, such as diagnostic gauge plots, revealed that LNAPL in the vicinity of MW-X was present under confined conditions. This finding provided an explanation for the historical LNAPL thickness trends observed at MW-X, and demonstrated that changes in LNAPL thickness had no bearing on LNAPL mobility. Other site data, including dissolved phase concentration trends and fluid level gauging data in wells located around the perimeter of the LNAPL body, provided compelling evidence that LNAPL was stable and not migrating. The low LNAPL transmissivity result at MW-X provided an additional line of evidence in support of a stable LNAPL body, and demonstrated that LNAPL recovery would not provide a meaningful reduction in LNAPL mass.